D and I went to worship Friday night at Beth El Shaddai, a Messianic synagogue in Bessemer. It was a BLAST! We were there for hours and the believers are so wonderful! They answered all of our questions and gave us each a copy of the “Complete Jewish Bible”. They celebrate all of the original feasts and observe the Jewish calendar. We actually danced in worship and sang in Hebrew! It was so wonderful! Please let me know if you would like to go sometime. I intend to go back soon!!! They will celebrate Purim on March 22nd if you want to come and Passover in April (more details to come). To redeem something is to pay or ransom for it or to buy it back if it originally belonged to you. In Hebrew the word redeem is “Padhah“. This can also refer to someone else’s sin against you. (Abuse, neglect, broken promises, lies). If you are in Christ the LORD will “redeem the years the locusts have eaten.” (Joel 2:25). Just like the demon on the shoulder of the man in C.S. Lewis’ book, “The Great Divorce”, Jesus will take the sin and pain of your past captivity and redeem it as a white steed you will ride upon in the beauty of His presence in heaven. 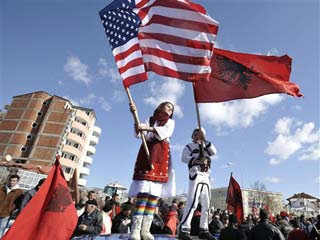 Now that Kosovo has declared itself an independent, democratic state will this open up doors for the Gospel to be more easily spread to the Albanians? I am going to research it post my findings in a future blog post. Russia and Serbia have renounced it. It may end up in more bloodshed before it is all over. But I can’t think of a time in history when gaining freedom from an oppressive power didn’t require the shedding of blood. My friend D. Watts read The Lord’s Prayer in Hebrew to me last night and I just couldn’t get over it. I want to learn to speak God’s word in Hebrew!!! She told me about this site. The words are spelled out phonetically and you can hear someone reading it so you know how to pronounce them. So awesome!!! I am going to start with the Shema. Why do so many of the emerging church websites speak of God/Father and less overtly or not at all about Jesus Christ the Lord? Claiming to be postmodern we are still marketing Jesus and hiding Him in the closet of respectability until we feel like people are ready to handle Him. Jesus can’t be handled and He doesn’t need spin doctors. I know we’re pretty fussy about music forms, but let’s bring back an old chorus, This Little Light of Mine, and in case we’ve forgotten the answer to “hide it under a bushel?” is NO! Al Mohler, Mark Dever, Joshua Harris, John Piper, Eric Simmons, and C.J. Mahaney sharing their heart for humble orthodoxy, New Attitude, and the local church. Humble orthodoxy is a commitment to believe, live, and represent biblical truth with humility. We believe that God has revealed Himself in Scripture and that His revelation reaches its culmination in the Person and work of Christ on the cross. God’s truth in Scripture should not be redefined or reinvented. Our role is not redefine truth but to receive God’s truth. We believe that the truth of the gospel transforms not only what we believe but how we live. Biblical truth doesn’t merely inform us, it introduces us to a person who changes us. We believe that the gospel demands humility from those who represent it. We want to represent the truth not merely as those who are right, but as those who have been rescued. Forget reinvention. Embrace a humble orthodoxy.